Ubiquitous Capture Device, What is Yours? Those of you who are followers of the Getting Things Done methodology will full understand the importance of the instant collection of your tasks. David Allen, author of the GTD system talks about the Ubiquitous Capture Device, meaning a device that is with you at all times enabling you to use it to capture your thoughts. I have been doing some thinking recently about the capture devices I use as part of my collecting strategy. I have been practicing GTD for around two years now and I always say that the biggest change and benefit brought to me is the ability to capture items as they enter my head so that I can collect these in my inbox and process them at a later date. Another GTD term is Open Loops and I have written many posts that cover Open Loops. Just as a refresher, an Open Loop is a task that is not recorded. Each time you think, gosh I must do this, and gosh I must do that and do nothing about it, it creates a little Open Loop in your mind that takes up valuable processing power and causes stress. The empowerment of capturing your thoughts, as you have them is the biggest benefit that I have got out of GTD. During the past few days I have been thinking about the various types of capture devices that I have used over the past two years and which have worked and which have failed. There are two main categories of capture devices, the high tech and the low tech. By high tech I mean items such as iPhones, Blackberries, Laptops, and PDAs. Preferably running some task or GTD based software application. The low tech options include a good old pen and paper. The paper can form a notebook, stickies, journal, or daily planner. It really doesn’t matter as long as you can record your thoughts. When I originally started implementing GTD I, like many others, rushed out and bought a collection of Moleskine’s. This is the techie in me who loves to go out and buy hardware, even when the hardware is a nice notebook. Moleskine’s are in my opinion the nicest notebooks that good money can buy. The quality of the finish and paper is second to none. I bought the large notebook, small notebook and also some of the small Moleskine Cahier notebooks. I use my large and small notebook for day to day use and meetings. I teamed up the Cahiers with a throw away golf pencil and this made it into my back pocket as my Ubiquitous Capture Device. This worked to a degree. As the Cahier notebook was an extra, it had to be remembered. It was not fully integrated into my life and there were times when I forgot it, leaving me without my trusty notebook to record tasks. I then ended up with around 6 dog eared Cahier notebooks “hanging around” and not really being productive. 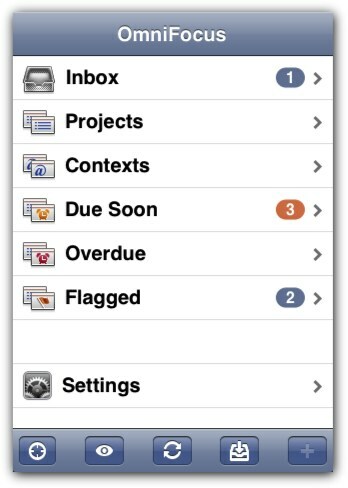 Then, the iPhone and OmniFocus for the iPhone came along. I started to use this as my capture device. My phone is always with me so it ticked the Ubiquitous requirement of the Ubiquitous Capture Device. The problem is that it takes a minimum of 10 seconds to get the phone turned on, OmniFocus load, and be in a position to add the task. Doesn’t sound like a lot but when you have an idea or task in your head that needs recording it sure does feel like a long time. There are two items that are ubiquitous to me. My phone and my wallet. These pretty much go with me wherever I go. I feel the most important part of selecting a Ubiquitous Capture Device is to get one works and you WILL carry it wherever you go. David Allen uses a low tech Ubiquitous Capture Device. He uses a wallet that has a built in notebook with tear off pages and an expandable Rotring pen. This works for David Allen and I am sure it would work for us all. I have a really nice wallet that my wife bought me a few years ago and I am not replacing it yet but when I do, this is something I will look into. In summary, my current tool of choice is OmniFocus as my Ubiquitous Capture Device on my iPhone. My phone is always with me so it fits the bill. The benefits of the high tech device is the ability to sync with my desktop OmniFocus so I never lose data but their is a speed trade off. Low tech capturing is much faster but you have to carry it, and also if you lose it, well you have lost it. I would love to hear from all you about your Ubiquitous Capture Device. Are you low tech or high tech? Do you have any cool tips to share with us all about finding the ultimate Ubiquitous Capture Device? This entry was posted in General Items, GTD General, iPhone Productivity and tagged iphone, moleskine, omnifocus, open loops, Ubiquitous Capture Device on January 16, 2009 by Andrew Mason. How I Solved the Problem of Collecting Tasks! Hope you are all having a productive day! If you are not already, now is a great time to subscribe to this blog in your favorite RSS reader so you can keep up to date with all the posts. One of the major improvements in my life since starting following the Getting Things Done Methodology, is the reduction of Open Loops. As we all know, Open Loops are those tasks floating around in the ether, that we should be doing, but we do not actively record. An Open Loop is anything pulling at your attention that doesn’t belong where it is, the way it is. Anybody who has read the Getting Things Done methodology will understand what I am talking about and if you haven’t, you don’t know what you are missing to get this area of your life under control. You could say I am a busy guy. I am actively involved with 5 of my own companies. I have four children, a wife, and an active social life. Now, I have a LOT to get done! I also had a lot of Open Loops before I made the decision to get my life my organized. If you are anything like me. Numerous times in the day, you would remember that you had some task to do. This could be related to your business, home life, or other. It could be any random task that either just comes to you, or something you are doing jogs your memory and bang, there it is. You are at that moment presented with a task, and one that needs collecting. Now, I have a pretty good memory and I used to try to remember these tasks in my head. Big mistake, and the start of an Open Loop. Then, the next day, or whenever, something would again jog my memory and I would be left with the same task entering my mind that needs completing. Some of these were important tasks that really did need to be collected and I, as I am sure you all, sometimes forgot things that were important. Removing these Open Loops from your life is one major step towards getting organized and it is no surprise that a lot of the first chapter of the Getting Things Done book covers the importance of closing these Open Loops. Now, one of the most important aspects of removing these Open Loops is to record the action/task as soon as it comes into your mind, without exception. It is the procrastination of not writing these down that make them into Open Loops. I much prefer Closed Loops!, Tasks and Actions that are recorded into a system that I trust. This is all part of the very simple GTD methodology. The very simple way that I have embraced this, is to very simply write things down as they come to me. Now, you need some tools to do this, a pen and paper. I had read about the Moleskine Notebooks on various sites such as 43Folders.com and thought they looked pretty cool so I went ahead and bought one from eBay. Well, I wrote a post about my thoughts on Moleskines, and must admit that I love them to bits. There is something about the quality that makes you take pride in writing, and collecting your notes into them. I own the small pocket Moleskine notebook, as well as the large Moleskine notebook. Both of these are hardback books. Now these books are fantastic for taking into business meetings and I must admit the larger one has had a lot of use. The small notebook normally goes away on trips with me, both personal and pleasure. The problem I find with these Moleskine’s is that I cannot easily take them everywhere with me. So, there were still times when an action came to me that needed recording and left me scrambling for a pen and paper to write it down. I have played with PagePacker, which is a pretty Cool Mac Application that allows you to print mini books full of Calendars, Lists, and also the GTD Flowchart. 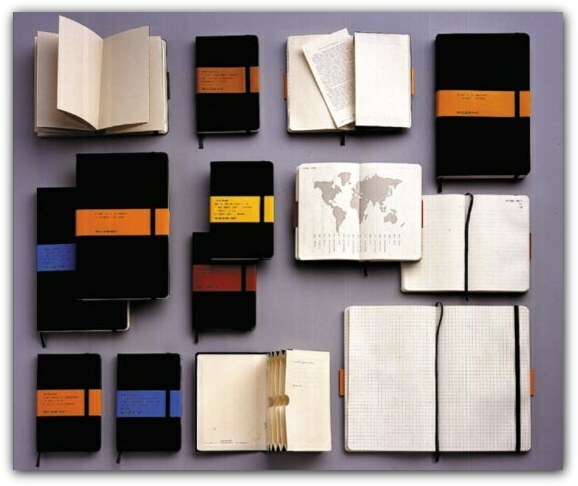 Luckily, I noticed that Moleskine did a range of products called “Cahier”. The Moleskine Cahier is small pocket sized book with a softback. It is slim enough, with only 64 pages, to fit into the back pocket of your trousers. The new Moleskine Cahier [kaa yáy] Notebook Series are each offered as a set of 3 notebooks, featuring a flexible soft cover, acid-free paper and visible side stitching on the spine. The last 16 sheets of each notebook are detachable, by means of a micro-perforated edge, perfect for exchanging loose notes. Inside the back page there is a spacious pocket for notes or clippings. Now, since buying a pack of three of these for a very reasonable £5 from eBay, I have tried to carry one with me everywhere to enable me to record my thoughts as and when they spring into my head, to remove all Open Loops from my life. So, now I have the paper sorted out, next is the pen! I have quite a few nice pens. Some I have bought myself and some bought for me as presents. I really like and own a few Mont Blanc pens, but the idea of carrying a £200 pen around with me doesn’t fill me with warm feelings, especially when I tell you about my Space Pen experiences! After reading various blog posts about Fisher Space Pens, I decided to go ahead and buy one. It cost me around £20 for the Space Pen Bullet. This is a little pen that is the normal size when the cap is attached in writing mode and half size when the cap is closed. Quite cool. These use pressurized cartridges so they can write upside down, underwater, and in space, hence the name. Now I believe in GTD, but not enough to take my pen with me swimming or the next time I go on a Lunar Mission!, so that did not really bother me but one great side effect of this technology is the fact that due to the fact they are pressurized, it makes them so the ink does not leak out all over your trousers. I used to keep the Space Pen in the little coin pocket of my left jeans pocket. many a time I would reach into my pocket and pull out my shiny space pen, stand on my head and collect my thoughts into my nice Moleskine Cahier notebook! Only problem was, after losing three pens, and having one washed in the washing machine (I blame my wife for not checking the pockets:) it became a rather expensive obsession! So, loathed to spend another £20 on these pens, I was forced to look for an alternative, to strive to find the perfect solution for recording my thoughts, and keeping those pesky Open Loops, well and truly closed! Do you know what?, I think I may have found the answer! I am a golfer. I play, or try to play as much as I can. I have played since the ages of 8 and I am pretty good at it. What does Golf have to do with GTD I hear you ask?, well, I remember using some Golf Pencils when I was younger that used to clip to the golf scorecard. So, after 2 mins searching on good old eBay, I managed to find some using the search term of “golf pencil”. Because the Moleskine Cahier has only 64 pages, the clip will either clip inside the front cover of the notebook or right up to the middle of the notebook to save your page. I clip the pencil to the notebook as you can see in the image below. This then goes in my back pocket and has been there for the past two weeks. I have travelled over a thousand miles in the car with this in my pocket and the pencil holds up just fine. You can sit on it, twist it, throw it, bend it, shake it!, and at the end of the day if you do break or lose it, you are not going to lose sleep over 7 cents! This little bit of simple help has changed the way that I am able to record my tasks, as the enter my head. I am no longer scrambling around trying to find a pencil, as I always have one to hand, in my back pocket, nicely attached to my pocket notebook. Closing my Open Loops has been the largest change that implementing GTD has brought to me. If I could say one thing to you about the Getting Things Done methodology, it would be to carry a notebook, write down the thoughts as they enter your head. It is simple, yet revolutionary. You have t get into the habit of carrying the notebook with you everywhere, pretty much as you have to wear shoes, you also have to carry your notebook,. I feel naked without mine now and it has just become a part of my daily life to carry it. Phew, ranting over. Hope you have enhoyed this post, if you have, I would love to have a comment and please add anything you can and agree or totally disagree with my thoughts. Keep having that productive day! This entry was posted in GTD General, GTD, My Review and tagged collecting tasks, Getting Things Done, gtd, open loops on January 14, 2008 by Andrew Mason.